Cause of her death was consumption. A picture in the possession of E L Fenn is titled Mrs Liveing, on the image, on the back it is endorsed "Catherine Downing b. 27 Nov 1767 d. 8 July 1802. Related to the Liveings - Adria" see picture file. This appears unlikely to be of Catherine Mary Downing? Claudia Buxton writes in 2008. 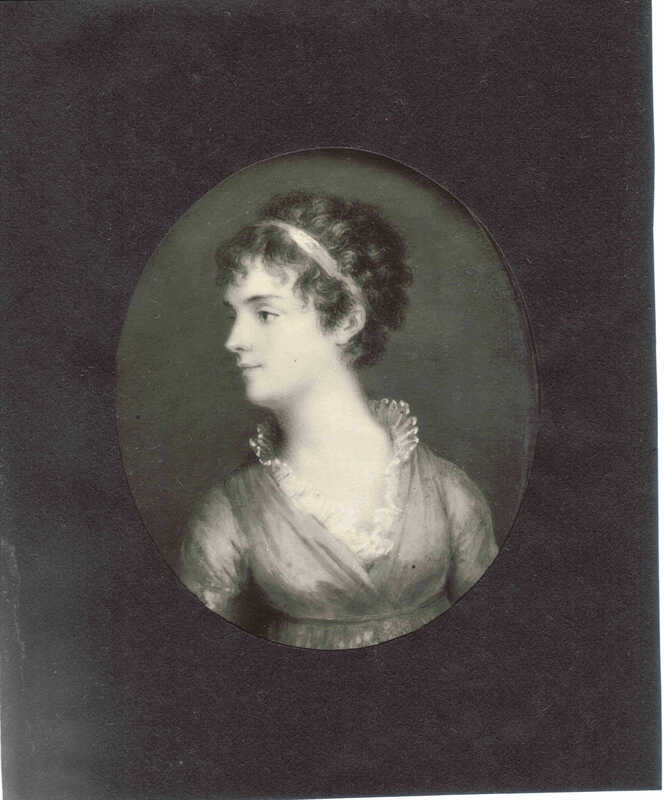 With regard to (Claudia's image of) Catherine Downing b.1767 - this is the same image as the one you sent me as Catherine Chambers. However, since the inscription on the back of your image matches the inscriptions on the back of (my) image I believe she must indeed be Catherine Downing, the daughter of George Downing, Rector of Ovington. She would be "related to the Liveings" by the marriage of her brother George whose daughter, Catherine, married Edward Liveing. I am unclear why it is inscribed Mrs Liveing (on the image). Perhaps it was a copy intended for Mrs Liveing (i.e. Catherine or Harriet nee Harrold)? Data from Aunt Millie's collection, Baldwin & Downing Pedigree. 1. Catherine Downing: Image, & notes by G D Liveing. A miniature of Catherine daughter of the Rev George Downing Rector of Ovington in smooth gold setting with a small lock of her hair under glass on white twill silk at the back (size of this sketch). Blue dress, white lace tucker, red hair, extremely fair delicate white and pink complexion, dark eyebrows, dark blue eyes, white silk fillet in hair. Grey background. She died of consumption when young. My mother remembers going to meet her from Castle Hedingham (where my mother was then living) at a Turnpike on the road from Ovington to London. She was then on her way with her sister Maria (after Mrs M KNOTTESFORD) to Bristol for the sake of change of air, whence she never returned, poor soul, and she was buried in . . . .
About the first year or two of the present century there was a great scarcity, the poor were half starved and there were bread riots in many towns. Many good and conscientious people thought it their duty to abstain from all super abundance of food at this time, and Aunt Catherine was rigorous in her self-denial in this respect, and being of a natural delicacy of constitution it was believed she there laid the seeds of the malady of which he died.